you will gain from this book is powerful and explains important terms and concepts clearly. This book is the only one of its kind which provides rules of thumb for valuing hundreds of different businesses. 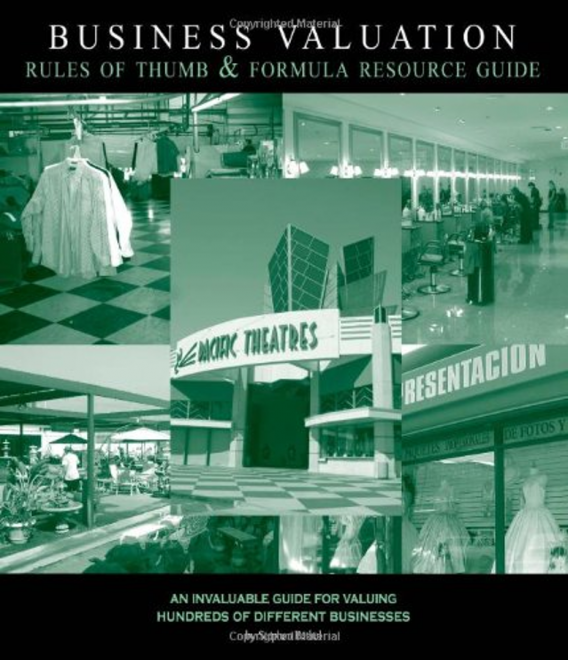 This book looks into hundreds of different industries found in the United States. In each section, the critical value drivers for a business are identified, along with the industry specific Red Flags and other risks related to purchasing a business that buyers should be aware of. For readers interested in learning about costs of operation, the book outlines key financial benchmarks for most of the business categories. Ratios for cost of goods sold, managers salaries, operating expenses, rent, working capital and profit margins can also be found in these sections. Of interest to many buyers will be the write-up sections of each industry which discuss available financing and typical terms for business loans. In our approximation, 50% of small businesses are purchased without financing, and most loans require a minimum down payment of +/- 30% of the purchase price. However, terms and pricing vary based upon the business type and time it was purchased. Typical rental rates are also provided for each type of business. At the end of each sections, the book provides information for further reading or reference that was useful to us in writing this manual. The chapters in this book are organized in accordance with the SIC (Standard Industrial Classification) numbers of businesses and NAICS codes. Chapter 1 discusses the Applicability of Rules of Thumb, Weaknesses of Rules of Thumb, Value Drivers for Businesses, Attrition of Customers, Barriers to Entry, Cash Flow Analysis & Trends, Competition, Covenants not to Compete, Franchises, Geographic Location Issues, History of the Business & Prior Problems, Industry-Specific Trends, Inventory, Working Capital and Receivables, Leases, Long-Term Contracts, Macroeconomic Trends, Options to Purchase Stock or the Business, Ownership of Premises (Real Estate) and Business Valuation, Patents, Return on Investment, Sales Trends & Number of Customers, Special Permits and Licenses, Strategic Acquisition, Terms of Sale / Financing, Adjustments, Turn-Key (Absentee Owner) Business, and a Checklist of Important Items for Valuation. Chapter 2 provides an overview of Horticulture and Animal Related Businesses. Chapter 3 provides an overview of Construction Businesses including special trade contractors. Chapter 4 discuses Manufacturing Businesses. Chapter 5 provides an overview of Transportation, Sanitation and Communication Related Services Businesses. Chapter 6 provides an overview of Wholesale and Distribution Businesses. Chapter 7 is the largest chapter and covers a number of Retail Businesses. Chapter 8 covers Finance, Insurance and Real Estate Related Businesses. Chapter 9 provides an overview of different types of Business Services. Chapter 10 provides an overview of Personal Service and Lodging Businesses. Chapter 11 covers all Automotive Businesses. Chapter 12 reviews Health, Education, Legal and Social Service Businesses. Chapter 13 looks at Recreational Businesses. Chapter 14 is an excellent primer on Buyer/Seller Due Diligence. Due diligence is the most important chapter to read and will pay for the book through the knowledge picked up after reading it. Chapter 15 provides a great overview of Selling a Business: Terms and Financing. Chapter 16 provides Typical Scenarios Used in Valuing Small Businesses such as items which need to be adjusted, when using rules of thumb. Important numerical examples include:how to use price to sales and owner s discretionary cash flow multiples, valuing a business with publicly traded comparables, how to separate the business value from the real estate value, how to account for skim, as well as other scenarios. Finally, the appendix presents all of the major references used with the addresses and telephone numbers for finding them.